This card is entered in the Crazy Crafters Project Highlights this week. Click here to see all the other great projects and vote for your favourites. I haven't finished experimenting with the gel card idea yet! Two of these little fish have been caught in a jar while the others make their escape! I strongly suspect that my treatment of the water and perhaps even the little fish swimming between the waves may have been influenced by the work of others that I've seen on Pinterest although I haven't consciously CASEd anyone. So I think I should say, if there are any elements of this card that bear a resemblance to something that I may have seen on Pinterest - thank you. I should have moved the fish in the jar before I took the photo - one looks a bit ill because he's upside down! The easel card is made from Dapper Denim card, to which I added a layer of Night of Navy card. The decorated layers are made from Pool Party Cardstock. I gave them a watercolour wash with Bermuda Bay and Dapper Denim inks, dried them and then ran them through the Big Shot with the Seaside embossing folder. I inked another piece of Pool Party card using Bermuda Bay, Dapper Denim and Night of Navy inks and the Swirly Birds stamp set and then cut out the long design from the Swirly Scribbles Thinlits. I used Dapper Denim ink and an aquapainter to paint some sections to create a bit of depth and then adhered it to the embossed panel, slipping some fish in before the glue dried. 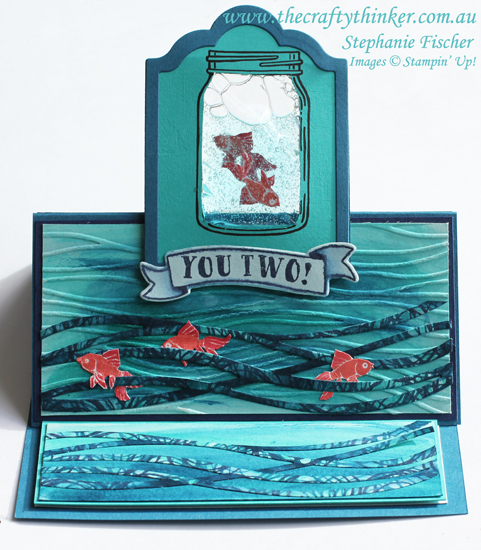 The fish were stamped with Calypso Coral and Watermelon Wonder inks onto Whisper White card using the fish in the Jar of Love set. I cut them out by hand and then used the Reflection Technique to ink the design onto the back of the fish. I used Calypso Coral and Watermelon Wonder markers to smooth out the ink and then laminated two of the fish. (Thanks for the suggestion again go to my reader, Rachel!) I then cut them out again and popped them into a small zip lock back with some shower gel. 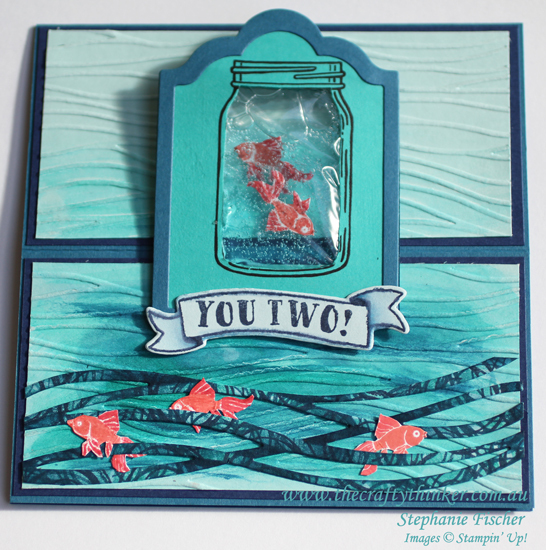 I stamped the jar onto a piece of Bermuda Bay card and snipped out the middle. I laid this on top of another piece of Bermuda Bay card and drew a pencil line around the cut edge. I then snipped along those lines. I created two frames from Dapper Denim card and adhered them to the Bermuda Bay panels and used Fast Fuse to stick the zip lock bag between the two pieces of "jar". I adhered that to the card front - being careful to apply adhesive only to the bottom of the panel, and added the banner with dimensionals. I stamped the banner and greeting from Banners For You in Dapper Denim ink and cut it out with the matching die from the Bunch of Banners Framelits (I bought them as a bundle and saved 10%). I then added a light wash with Dapper Denim ink and dried it quickly to avoid too much blurring. The decorated panel is popped up on dimensionals to support the easel. 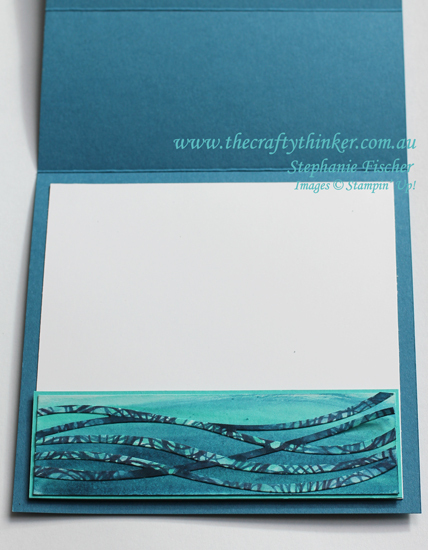 I repeated the watercolour wash and Swirly Scribbles panels on the inside of the card - just omitting the embossing.